Why not book a whole Eco Day or Week for your school to help your school get an eco flag and meet many of the Curriculum for Excellence outcomes? 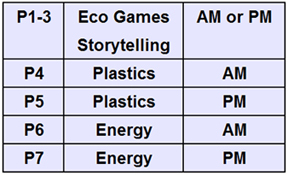 A selection of the following activities can be included in your Eco Day/Week, depending on the size of the school. Each activity will be tailored to your needs. Climate Tig – the children learn about Global Warming in a fun and interactive way. Wooden toys – our selection of handmade games – made out of recycled wood and hosepipe – lets the children try out traditional games, such as skittles, horseshoes, Kubb and hoopla golf, and shows them that games can be made at home with waste materials. Includes a talk on the 3Rs (Reduce, Reuse and Recycle). Walk to School Initiative – see how many pupils can take up the challenge to walk to school and discover the amount of CO2 emissions they can save in just one day! The ‘Big Swap’ – pupils discover how easy it is to get a new toy, book or comic without spending a penny (to the delight of many parents)! All activities are co-ordinated by us, so choose a day/week and we will ensure that your school has an experience to remember! The cost depends on the size of school and its distance from KY3 9YG. Please get in touch for an exact quote.